For much of its history, farming in Mississippi was inextricably linked to mules, which were hitched to plows, planters, cultivators, and wagons. While mules were used to a limited extent in other regions, between 1850 and 1950 southerners adopted and employed the animals to a degree unprecedented anywhere else in the nation. Mules are a crucial part of Mississippi’s agricultural, economic, and social history and heritage, a part of the state’s history that disappeared as capital-intensive, mechanized agriculture replaced tenancy and sharecropping. Before the advent of tractors, mules provided the draft power for practically every aspect of Mississippi agriculture, from plowing to planting to hauling crops to market. Acknowledging the importance of the animals, the Mississippi Department of Archives and History mounted a 1981 exhibition, Mules and Mississippi. During the years that mules prevailed as the chief draft animals on Mississippi farms, nearly all Mississippians, regardless of race, gender, or economic status, had some contact with the animals. Mule farming was a labor-intensive process that required long hours behind a mule, often with old and inefficient equipment. Because labor was required to pick cotton at the end of the season, landowners had little incentive to modernize other aspects of cotton production even when doing so was possible. Thus, one-row cultivators and walking plows remained standard items on many cotton farms and plantations as long as they used mules, whether the farmer owned one mule or, like the Delta and Pine Land Company plantation, a thousand mules. Statistics from agricultural censuses highlight the relative importance of mules, horses, and tractors in Mississippi. In 1930 the state’s 312,663 farms had roughly 370,000 mules, just over 102,000 horses, and 5,542 tractors. The state’s mules were valued at $32 million and horses at $6.2 million. By 1960, however, machines had replaced draft animals to the extent that the government no longer deemed it necessary to count mules. Mules are hybrid animals, the result of a cross between a donkey and a horse—usually a jack or jackass (male donkey) and a mare. (A male horse can also be bred to a female donkey, or jenny, but that union was rare.) Mules are sterile and do not produce offspring. The jack provides long ears, small hooves, surefootedness, and toughness. The mare contributes an active disposition and size. Mules were produced in many sizes for various purposes, with mining mules the smallest and draft mules the largest. Most mules used in Mississippi were bred and raised outside the state, however, since it was usually more convenient to rely on specialized suppliers than it was to raise mules on one’s farm. 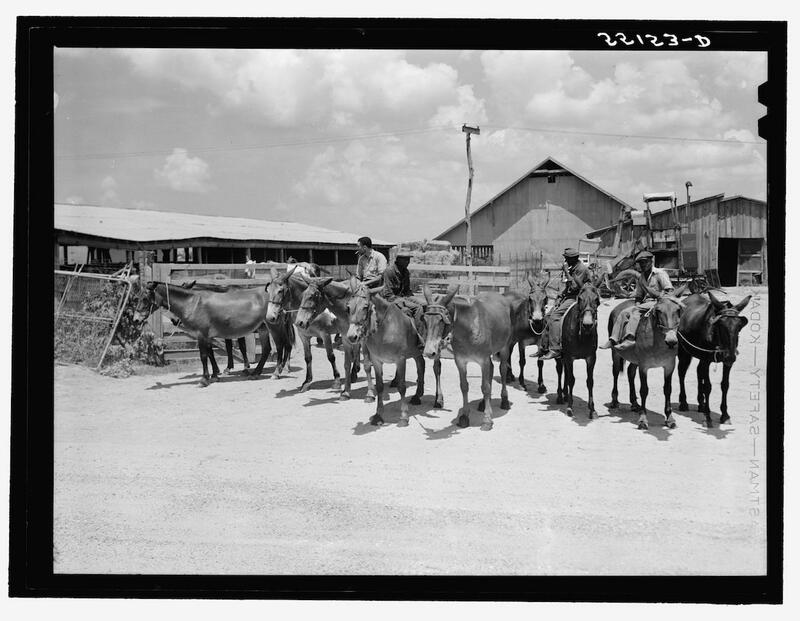 During the 1930s and 1940s, however, Mississippi farmers raised significant numbers of home-grown mules because the outside supply had begun to diminish. Tractors catalyzed a significant decline in mule use during the same years, but the development of a viable mechanical cotton picker truly heralded the end of the mule era, removing the last bottleneck in mechanizing cotton production. Along with the cotton picker and tractor, herbicides and pesticides also removed much of the need for manual labor in cotton production. Because they dominated as draft animals in Mississippi for nearly a century, mules took on iconic status. As such, they symbolized the best and worst of cash-crop agriculture. Mules evoked the hardiness and vibrancy of rural culture, but they also came to be equated with sharecropping, poverty, inefficiency, and resistance to change. Mules represented an integral component of rural folk life and music. The passing of the mule era constituted much more than the simple end of farming with draft animals. The decline of mule farming in Mississippi was part of a much larger reshaping of the state’s social and economic landscape. Rural Mississippi was deeply altered by highly mechanized agricultural practices that required substantially fewer laborers, but the more profound changes related to race, politics, and economics are still under way more than half a century after the end of the mule era.